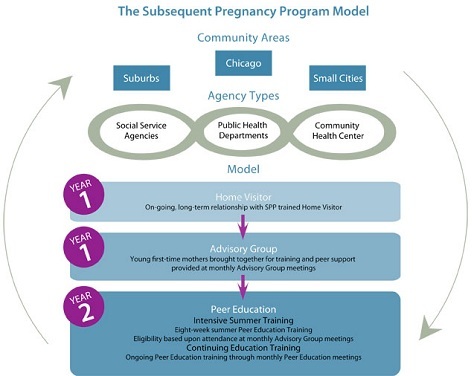 The Subsequent Pregnancy Program (SPP) is a community-based program that focuses on helping first-time adolescent mothers become self sufficient before deciding to have another child. The program works to break a two-generational cycle by helping young mothers graduate from high school, develop positive parenting skills and ensure school readiness for their children. A bond has been created between the staff and me… they nurture, teach, protect, defend, coach and discipline. SPP supports participants through two primary interventions: a personal, long-term relationship with a home visitor and intense training through group participation. Second-year participants are trained to work as Subsequent Pregnancy Peer Educators in their own schools and communities. Participants are African American, Caucasian, Mexican and Puerto Rican, ages 12-18. After participating in SPP for one year and completing eight weeks of summer training, young mothers can become Subsequent Pregnancy Peer Educators. As Peer Educators, they work with hundreds of first-time adolescent mothers through school and community presentations and one-on-one communication. Help adolescent mothers break the cycle of early child-bearing and poverty. You can donate through our GoFundMe Campaign and help us spread the word.